nancy rosetta: Bazaar Bizarre Boston and some other good news. Well, I got the application in for the Bazaar Bizarre Boston today, the last day for applications. Kim and I applied together, I love the fact that we will have each other for support, so that we can go to the bathroom or take a break without worrying about the table. She helped so much with the application, she wrote most of the wording and I am super happy with how it sounds and looks. 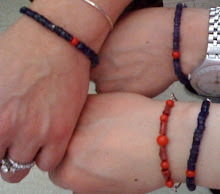 My pictures aren't the best, but with the link to my and Kim's etsy stores, I hope they will see the vision. I have been a bit stressed out the last couple of days over this, so now I can relax knowing that I did all I could. Also, the gallery got decked out today with our new show for September "Life is a bowl of..." It is looking so colorful and fun in there, I hope everyone has a chance to come check it out during the month of September! You can even vote on your favorite piece! More good news... the South End Open Markets has extended an invitation for members of Boston Handmade to showcase their work, and you better believe that I am taking them up on it! 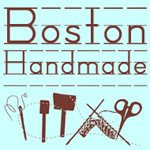 This is a huge showcase of handcraftiness that runs all summer long and Boston Handmade will be a show in a show on October 12th. I am so happy about this since I did apply to their Baked Fresh show for October 5th, but the jewelry slots were full, so I didn't get in. I am not discouraged tho, I got a really pleasant rejection letter stating that they were "impressed" with my work "but the jewelry category is full", so there is that. Wow, this has been an incredible week. Everything above aside (all incredible stuff! ), my morning office just moved from Needham to Canton. So, now I have the most incredible drive through trees, a country club and a cemetery. There is only one stoplight on my way now, and it is right at the start. My morning commute is now cut down to a pleasant 6 minutes from a trafficy horrible 30 minutes. The new office is located above a shopping center and I even have a window to look out of now (see the two windows above chico's? one of them is mine!)! Yeah, that needed exclamation points separated by a parentheses. Nancy, This post of your was a dream to read. What great news all around. and nancy, sad, no Bazaar Bizarre. Ah well, thanks for taking a stab at it. I guess perhaps I am still too green. There is always next year! I was oddly relieved by the rejection, the show is huge, by far the largest I have ever applied to, I think that's why I wouldn't have applied had we not been sharing space. I still have the South End Open Market, that's a big one, too...no sad faces!! They don't know what they are missing! !